EBICS is the established electronic banking standard for companies and public administrations in Germany and other countries. 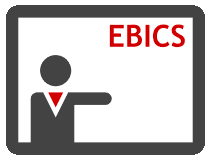 Business-Logics now offers a training for EBICS to transfer basic and expert knowledge for daily use. You would like to prepare your accounting staff quickly and efficiently for EBICS or strengthen your e-banking hotline? With our training courses in Hilden or on your premises, beginners and advanced users learn everything they need for professional day-to-day business. Starting with the initialization up to the innovations of EBICS version 3.0, you will discuss the whole range of topics with our EBICS experts. In addition to the information material, all business transactions are illustrated by means of live presentations. For further information and reservations, please contact our sales department by phone at +49 2103 33993‑30 or by email to .